Ordinary things still surprise me. 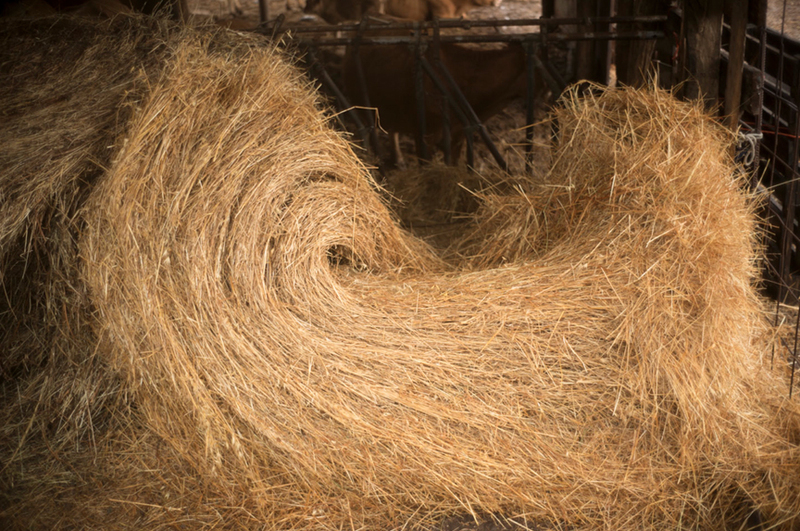 A hay bale for instance, rolled up in the fashion of today’s farming methods, is often just pitched into the stall for the cows to chomp it down in their own sweet time. But here it unspooled itself when the wrapper was cut, and mimicked the wave that was already set in motion by the winds while the grain was growing in the fields earlier that summer. While standing in front of it, the ‘object’ it became was satisfying to look at in unexpected ways, and led me to both see it for what it was, and to reconsider it for the other non-objective properties it held. I saw the color it became in it’s season of drying, I looked at the light it appeared in in the darkness of the stall, I thought about the flatness it presented while at the same time being enriched with curves, swirls, and eruptions of forms that splintered out along its edges. All these small thoughts made me stand there staring at a hay bale! At times I wonder how these simple things have taken hold of me; a city boy whose love of the messy mix of speed and life on the streets has been overtaken by the study of stillness in the form of natural or man made things. It must be a certain time of life I’ve entered. I am taking ‘long looks’ at things that earlier slipped by and now call out for consideration. This entry was posted in Interior, Light, Tuscany and tagged Hay, Interior, Light, Tuscany on September 29, 2015 by joelmeyerowitz2014. A very pleasing image, I like your interpretation of it too. It’s interesting to read your ideas about the photos each day.